Quentin Pickard has provided this photo showing Brentford Dock, built in 1859 on land which was formerly James Montgomrey's timberyard. The Great Western Railway served the docks. See 'Brentford Past' by Gillian Clegg for historical details. 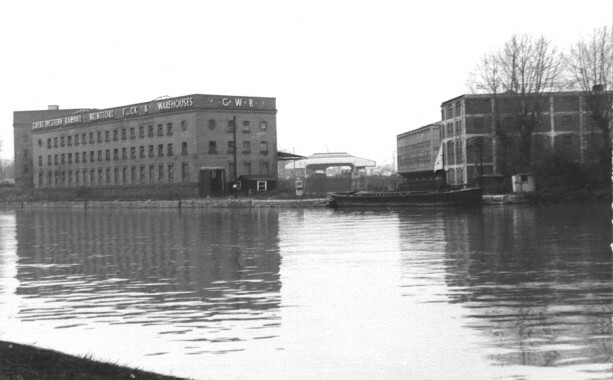 Signage on the prominent warehouse: 'Great Western Railway Brentford Dock & Warehouses' and 'GWR' on the shorter side. The closure of the London docks in the 1960s led to the closure of Brentford Dock and its railway line in 1964. Brentford Dock housing estate (1970s) and a marina now occupy the site.